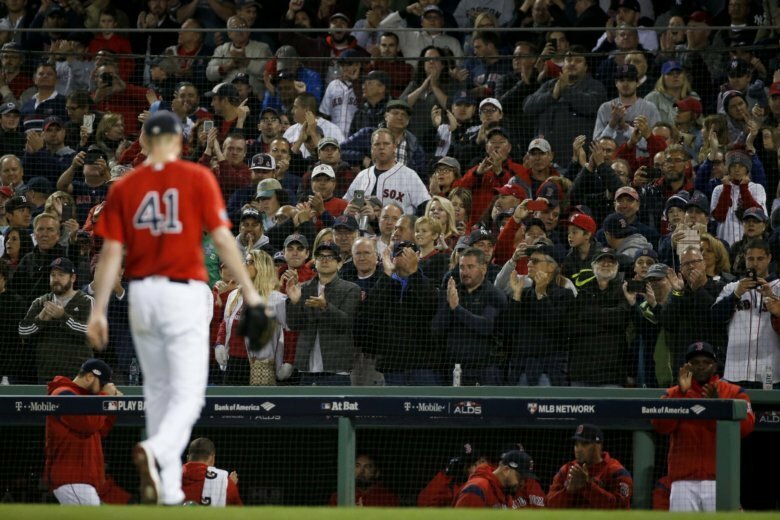 BOSTON (AP) — Chris Sale left the mound to a standing ovation and then waited along with anxious Red Sox fans while the Boston bullpen frittered away most of a five-run lead. Bases loaded in the sixth inning. Two runs. Bases loaded, nobody out in the seventh. The Yankees scored another. A leadoff home run by Aaron Judge in the ninth made it a one-run game. It was only after Craig Kimbrel struck out the last three New York batters that Sale could savor the first postseason win of his career, a 5-4 victory over Boston’s longtime rivals Friday night in Game 1 of the AL Division Series. Game 2 in the best-of-five series is Saturday night, with Boston starting another pitcher trying to overcome a history of postseason struggles: left-hander David Price is 0-8 as a starter in the playoffs. He’ll face Yankees righty Masahiro Tanaka. In the first playoff matchup between the teams since 2004, J.D. Martinez hit a three-run homer off J.A. Happ in the first. The 108-win Red Sox made it 5-0 in the third and then white-knuckled it as New York slowly chipped away after Sale left with two on and one out in the sixth. New York, which won 100 regular-season games plus the AL wild-card game against Oakland, got three singles and two walks in the sixth, scoring two before Brandon Workman — the only player on the Red Sox roster with a World Series ring — struck out Gleyber Torres to end the threat. The Yankees loaded the bases with nobody out in the seventh but scored just one run. Boston manager Alex Cora used scheduled Game 3 starter Rick Porcello to get two outs in the eighth before turning to Kimbrel for a four-out save. Boston fans were ready, with derisive chants for the Yankees during introductions and again after J.D. Martinez smacked a 2-0 fastball into the glove of a stem cell researcher in the front row of the seats above the Green Monster. Sale left with a 5-0 lead after giving up singles to Judge and Stanton in the sixth; both came around to score. In all, Sale was charged with two runs on five hits and two walks in 5 1/3 innings — the longest playoff outing for a Red Sox starter since 2013. Martinez and Benintendi each had two hits for Boston. Judge had three hits, including the only extra-base hit, and Luke Voit had two singles for New York, which went 1 for 7 with runners in scoring position. Happ lasted just two innings for his shortest postseason start, allowing five runs on four hits and a walk while striking out two. The Yankees had 10 hits, but the first nine were singles. Stanton, who hit 38 homers in the regular season, had four of the Yankees’ 13 strikeouts. Ryan Brasier faced three batters and two of them reached. Workman got a big out but also allowed two hits and a walk. Matt Barnes walked one but allowed an inherited runner to score. Even the usually reliable Kimbrel coughed up a run. Just like that, the 5-0 lead was down to one run. It was exactly the kind of performance that had Boston fans in a panic entering the series. But Workman insisted the team is still confident in its bullpen. “I believe we’re the guys that are going to get the job done,” he said. Aaron Hicks singled off Sale to start the fourth — ending an 11-pitch at-bat — but once he got to first base he began flexing his right leg. After a visit from the trainer, Hicks was replaced by pinch-runner Brett Gardner. Hicks, who battled hamstring problems down the stretch, was also late going out to center field in the bottom of the first. The team said he had tightness in his right hamstring and was being evaluated. Price pitches for the Red Sox in search of his first playoff win as a starter, though he has two postseason wins in relief. Tanaka pitched seven shutout innings in Game 5 of the ALCS against Houston last year.